All posts in Business & Entrepreneurship category. 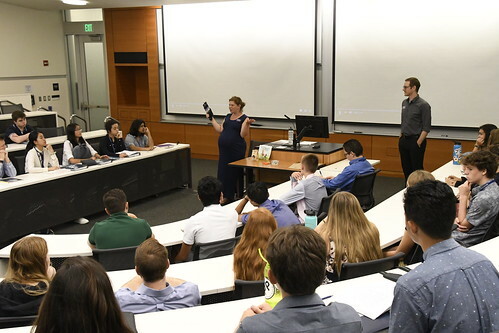 On Tuesday morning, Business & Entrepreneurship students visited the University of Washington’s Buerk Center for Entrepreneurship. They completed an entrepreneurship challenge under the guidance of Buerk representatives. For the first of their two guest speakers on Saturday, Business & Entrepreneurship heard from NSLC alumnus Sam Movish. Born in Kansas, raised in Cincinnati, Sam is interested in the atypical. From his punk and heavy metal music preferences to his navigation through academic and professional endeavors. Having graduated from The Ohio State University with the first ever Fisher College of Business Strategic Risk Management B.S.B.A., Sam has continually set himself apart from others. During his summers in college he was a Program Director and Team Advisor with the National Student Leadership Foundation and Conference. Having spent a summer at Yale University and one at Northwestern University, Sam was ready to pursue a professional career on the west coast. He found his home in Vancouver, WA working for Fisher Investments in the Client Operation Department. Sam loves exploring the Pacific Northwest terrain, eating great food in downtown Portland, and simply enjoying the moment… and yes, you will still be able to find him at your local heavy metal venue. Dr. Carrie Colbert will be presenting a series of lectures to the Business & Entrepreneurship students throughout their time here at the University of Washington. The first was a discussion of business management and effective business communication. NSLC welcomed over 170 students to campus today! They moved into their residence hall, got acquainted with their team advisers, toured the campus, met the administrative staff, and attended their opening ceremony. Session 1 Registration Day at UW!